As social media management tools like Hootsuite and Sprout Social have become more sophisticated, they have expanded their dashboards to better accommodate “social listening.” By tapping the rich data available in social media, social listening can help brands with competitive analysis (What are other brands doing that we could be doing better? ), determining consumer sentiment (How happy are our customers? ), and customer service (A brand’s timely response to an unhappy tweet can make or break public opinion about them). SayWhat has been working with social listening tools since 2006, when we collaborated with Umbria, a start-up based in Boulder, Colorado (subsequently acquired by J.D. Power). We helped Del Monte gauge consumer reaction to the massive pet food recall of 2007 due to tainted wheat gluten. We also helped them discover that travelling with pets was a high-priority unmet need for pet owners. As part of our work with Frito-Lay, social listening helped us gain a better understanding of the snacking needs of teens, boomers and women. SayWhat colleague Sarah Bly recently spent time analyzing the social listening tools currently on the market. Sarah says, “My discussions and research have led me to believe that there is not a ‘perfect’ solution, particularly for qualitative research. My conversations with researchers suggested they often use manual searches for two key reasons: 1) the available tools are not designed to produce thematic findings and 2) many cost far too much. You can download Sarah’s full report here. Search Capabilities: Provides comprehensive search for terms on various platforms including social networks, blogs, news sites, forums, and other user generated content. Keyword Monitoring: Monitors brand keywords, competitor keywords, and other relevant keywords or related search terms. User-Friendly Interface: Displays findings in an easy to read, easy to download and easy to share manner. Sentiment Analysis: Ability to (accurately) monitor sentiment towards keywords. Filtering Capabilities: Ability to filter non-topical keywords, websites and other spam from searches. User Data Analysis: Provides trend visualization, demographic analysis and influencer identification features. Google Trends: Google Trends allows you to see how keywords have trended over time. You can get insights into the traffic and geographic visitation patterns of websites or keywords and you can compare the search popularity of up to 5 keywords. Social Mention: Monitors over 100 social media sites for keywords. Provides basic feedback including strength, sentiment, passion and reach. This tool is easy to use and nice for quick searches. Twazzup: This tool is a basic monitoring tool for Twitter. You enter your search term and receive the most influential posts, most retweeted pics/tweets and 10 related keywords. IceRocket: Allows you to monitor keywords on over 200 blogs, Twitter and Facebook in 20 languages. Topsy: (NOTE: Topsy was acquired by Apple and shut down in late 2015) This tool is Similar to Social Mention but monitors Twitter only. Recently purchased by Apple and its clean, simple interface reflects Apple’s aesthetic. 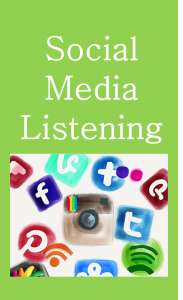 Sarah suggests these top five low-cost social listening tools for those brand managers who have a limited budget, but still want to stay on top of discussions about their products and/or brands across the web. Hootsuite: Free to $1500+/month (Enterprise license). Many suggest it is better tool for social media management than “listening” but they have recently expanded their analytics tools for their paid subscribers. Mention: $29-Custom/month. Known for having a nice user interface and covers many different platforms. Limits each monitoring campaign to 5 search terms. Webfluenz: $50/month for very basic search, 299-399$/enterprise plans. Trackur: $100 – $450/month. This tool provides a fairly broad and comprehensive search of blogs, Twitter, Facebook, news. It has a reputation for great coverage of many formats. SproutSocial: from $59 – $500/month. A fairly basic service that allows for keyword tracking on many platforms. Radian6, Sprinklr, and Brandwatch are some of the more well-known Enterprise tools for social listening. The granularity of results are probably most useful for large corporations and national brands. Most companies will probably find the fire hose of information they provide to be overkill. 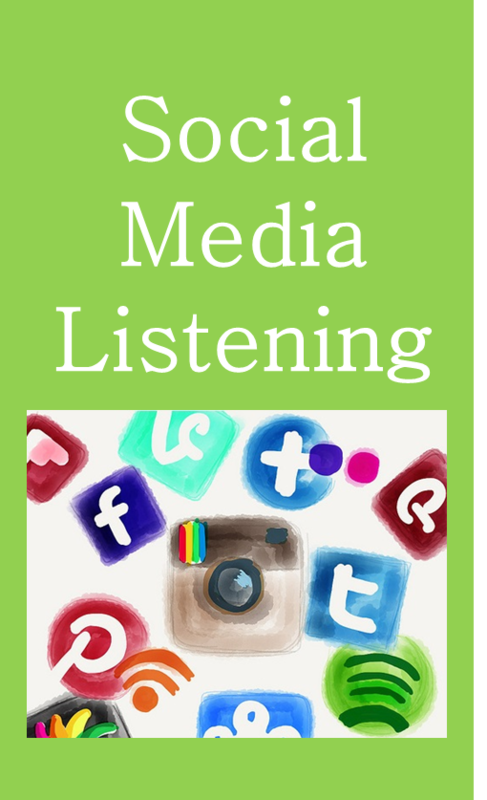 Even with the aid of the most sophisticated tools, the results of your social listening may be difficult to interpret. Let us know how we can put our years of experience to work accelerating your social listening efforts, bringing you actionable insights that will strengthen your engagement with, and understanding of, your audience.